Google Analytics has a tool that is effective in helping anyone who wants to build an online business. 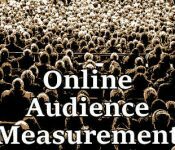 Online audience measurement is fundamental to managing and growing a Web business. Increasing content page views for a site depends on a handful of popular articles. The great majority of views will take place among a great minority of pages. As a result, visitors state clearly they prefer quality over quantity. A deep dive into site analytics can improve bounce rate, which is one of the best metrics for measuring how an audience interacts with a website.